Slain Somerset County Cpl. Eugene Cole's brother, Tom Cole, says he is feeling relieved after authorities arrested suspected killer John Williams on Saturday. Tom Cole is offering forgiveness to Williams, but would like him to say he was sorry and see sincere remorse for what he has done. 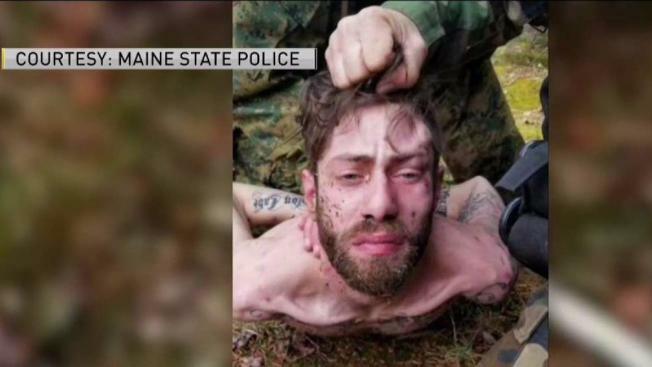 A four-day manhunt for a man accused of fatally shooting a Maine police officer ended Saturday, with a seven-man capture team arresting the suspect using the slain officer's handcuffs. Sheriff Dale Lancaster told reporters Saturday that using Somerset County Cpl. Eugene Cole's handcuffs to arrest 29-year-old John Williams felt "fitting." "He killed my deputy and he was brought to justice using Cole's handcuffs," he said during a 4 p.m. press conference providing details on the capture. Cpl. Cole's brother, Tom Cole, said it made him smile when he heard of the symbolic gesture. "Today is a very good day," Lancaster said to start the press conference. "Today at 12:43 p.m., John Williams was taken into custody at a camp located off of Route 139 in Norridgewock." State Police Lt. Col. John Cote added that Williams offered "limited resistance" to his arrest. A photo taken by the capture team shows Williams with his head being lifted up by authorities. The State Police Lt. Col. said they needed to take a facial picture to confirm the suspect's identity and that he would not cooperate to raise his head to the camera, forcing them to physically pull his head up. Williams was transported to the Waterville Police Department after being checked out by EMS. He was transferred to the Maine State Prison in Warren around 5:30 p.m. Saturday where he was screened by medical staff and placed into secure housing. Police interviewed Williams after his arrest, which may help them answer their biggest question: why? Williams is being held at the Maine State Prison at the request of the Somerset County Jail, a process routinely utilized when an inmate requires additional security precautions while awaiting trial or sentencing. He is expected to make his initial court appearance early in the week. The suspected cop killer was captured during the fourth day of the manhunt in the area of 807 Norridgewock Road. Lancaster said his first call was to the Cole family to personally notify them of the arrest. "They were relieved, thankful and very grateful," Lancaster said. Tom Cole says he is feeling relieved and is offering forgiveness to his brother's accused killer. "I would tell him that I forgive him, and I would like to have him say he was sorry, and see sincere remorse for what he has done," Tom Cole said of Williams. Lancaster said he is also extremely relieved and cannot express in words his gratitude to everyone who has helped in some way. The multi-day manhunt for Williams included helicopters, armored vehicles, and police cruisers. Local schools had been in lockdown as federal, state and local law enforcement poured into the region to help. "Tonight, the citizens of Somerset County can sleep well knowing a dangerous man has been taken off the streets," Sheriff Lancaster said Saturday afternoon. Cote said starting with their initial response on Wednesday, they were confident they had contained the suspect to a large wooded area. "Each day we assembled teams to slowly and methodically search the difficult terrain," he said. Teams encountered critical evidence and signs of activity several times which gave them confidence Williams was still contained in the area. Throughout the multi-day hunt, law enforcement found fresh tracks that led to the area Williams was found, in a camp outside the area of Lost Brook. Maine Gov. Paul LePage thanked law enforcement in a Tweet Saturday for their "outstanding teamwork." LePage had said Friday that all hunting was to be suspended in portions of Norridgewock, Skowhegan and Fairfield. That included the start of youth wild turkey season Saturday. The shooting of Cole on Wednesday in Norridgewock triggered an intensive search for Williams in and around the heavily wooded rural community about 60 miles west of Bangor. He was considered armed and dangerous. Police urged the community to keep homes and cars locked. Cole was gunned down between 1 and 2 a.m. Wednesday on Route 2 in Norridgewock. Williams then allegedly stole Cole's marked cruiser and robbed a Cumberland Farms store on Waterville Road. He was last seen fleeing in the stolen cruiser. The cruiser was found abandoned around 5 a.m. off of Martin Stream Road in Norridgewock. Investigators believe Williams then fled on foot, sparking the manhunt. Cole was 62 and a 13-year veteran of the department. Sheriff Lancaster called him an "outstanding employee, one of the finest deputies." Kimberly Sirois told NBC10 Boston she found Cole's body on Wednesday morning. She said Williams was like a son to her and lived with at her Norridgewock home from 2003 until last Christmas, when she kicked him out for doing drugs. He moved in when he was in high school after a falling out with his parents. "As I lowered my eyes, I saw him," she said. "I asked him, 'Officer, are you OK?' and didn't get a response." With the manhunt now over, Lancaster said the Somerset County Sheriff's Office now has the opportunity to pause and grieve the loss of their friend and colleague. "We can now focus on the important task of respectfully laying our fallen brother to rest," he said. "He was an outstanding officer, paid attention to detail. He really epitomized community policing before there was community policing." A viewing for Cole will be held May 6. A funeral is planned for May 7.